Join the Cambridge Writers’ Workshop on our summer writing & yoga retreat to the cultural oasis of Granada, Spain. Located at the foot of the Sierra Nevada mountains in Andalucía, Granada is one of the gems of Spain and has inspired writers from Washington Irving to Salman Rushdie to Ali Smith. Let the old city stimulate your writing with its winding streets, Moorish history, and evocative landscapes. Or, indulge in delicious Andalucían cuisine and traditional Arab baths. Work on your existing manuscript, or look to the beauty and warmth of Granada to inspire all-new projects. The retreat offers the opportunity for writers of all genres and levels to work alongside award-winning authors & editors to hone their craft and expand their writing skills, while working on new or existing projects. 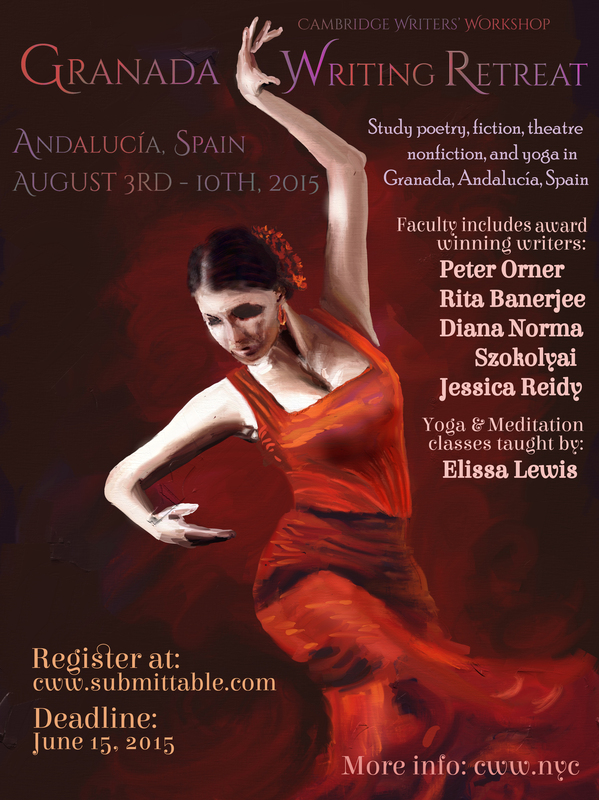 Our Andalucían writing retreat will take place from August 3-10, 2015, and the cost of the workshop is $2950, which includes lodging, craft of writing seminars and writing workshops, yoga classes, room cleaning, and breakfast. Optional add-ons include reiki healing and aromatherapy sessions. The retreat will be held at Hotel Guadalupe on Paseo de la Sabica in Granada, Spain. Faculty includes Peter Orner (fiction, nonfiction), Rita Banerjee (poetry, fiction), Diana Norma Szkoloyai (poetry, nonfiction), Jessica Reidy (fiction, poetry) and Elissa Lewis (yoga, meditation). 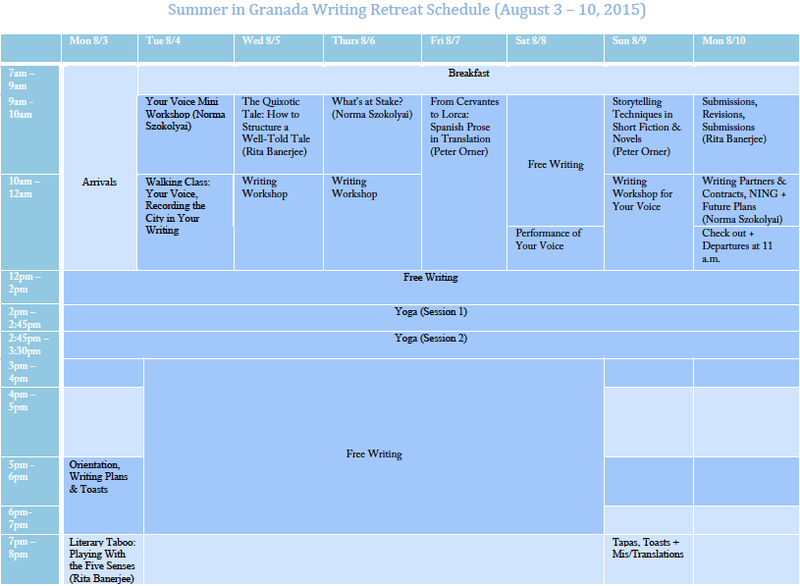 If you’d like to join us in Granada, please apply online at cww.submittable.com by June 15, 2015, and include $5 application screening fee and a 5-page writing sample. (Due to limited seats, early applications are encouraged, but check for rolling admission after deadline, depending on availability). One way to see the difference between a short story and a novel is to compare a single pang in one’s heart with the tragedy (and potential triumph) of one’s whole life. It’s all a matter of how you feel the pain (and the joy). A story is complete, not a word wasted, and therefore remorseless. Read a great story and there it is—right now—in your gut. So often stories go off the rails because they lack the immediate intensity – even if this intensity is quiet – that a good story needs. No silver bullet, as each and every story is different, but in this mini-workshop, we’ll discuss the mystery of why certain stories have such a profound impact, talking about such intangibles as compression, momentum, and tension. We’ll look at among other writers, the stories of the great Japanese writer, Kawabata, who is able to do so much in so few words in what he calls “Palm of the Hand” stories, and Grace Paley who likewise, in just a few sentences, could capture a distinct universe. We’ll also discuss story openings. Writers will leave at least a handful of their own stories in progress. To give a sense of Spanish literature through the ages, we’ll be reading a mini-anthology of Spanish writers beginning with excerpts from Don Quixote, arguably the first modern novel, and one that remains a touchstone of wildly provocative literary innovation. From Cervantes, we’ll look at more contemporary works, including the well-known plays of Lorca, as well as lesser known, but equally compelling stories and novels of Ana Maria Matute and Javiar Cercas. This workshop is based on Rita Banerjee’s theories of lyrical objects and on her original object-based prompt. Enjoy searching for and discovering evocative objects in your surroundings, and tell their stories through lyrical descriptions that will thrill the reader. Learn to play a literary game that will keep you on your wordsmithing toes. You will have to think of new ways to write about subjects, while avoiding clichés! Whether preparing for a literary reading or recording your poetry with musicians, it is important to develop your own voice because it is the vehicle for your words. In these sessions, you will connect with your inner voice to bring it outward, learning how to better create a bond between you and your audience. Flamenco is a rich musical tradition grown out the Romani tradition that flourished in Spain—and as Flamenco is rooted in the Romani oral tradition of story-telling, the various musical forms are rich with meaning, just by virtue of their rhythm and structure. In this class, I’d like to examine and listen to two or three popular Flamenco forms and try some writing exercises in which we employ these rhythmic techniques and try to use the meaning of the form to enhance our own content. As writers, we have an intuitive sense of rhythm—the iamb is the beat of the human heart. But many writers are not aware of the semantics of rhythm, for example, what it means when there is a rest after a series of beats, both to the untrained ear and the informed reader. I’d love to have a couple of pre-recorded or live-music demonstrations, one in which we write our impressions of a song, and the other in which we write our own words to the beat of the song. Similarly to the above course, some cultural and historical will be helpful to the students, but depending on whether I teach both classes and/or which course comes first, I will of course tailor my contextualizing. Lorca, in many ways the voice of Granada, also gives voice to the Romani people, albeit in a limiting fashion, curtailed by the mold of archetype. I get emails from many writers struggling to write out of their own demographics, despite their best intentions to be inclusive in their fiction and poetry with respect to gender, sexuality, ethnicity, and socio-economic status. This becomes especially complicated for writers working in poetry, fantasy, magical realism, The Fantastic, etc. In this class, we will examine how Lorca creates a simpatico between the speaker and the Roma—both outsiders, both struggling hardship, and both living life through art and trades—and how he plays on the Gypsy archetype to build metaphors for the pain of love, war, and fate. But we will also consider the reductive aspects of Lorca’s Gypsies—the Roma represent that which is primitive, natural, decorative, and functional—with the intention of learning how to write three-dimensional characters in both poetry and fiction who have their own meaningful stories to tell. In other words, we will learn how to give blood to the archetype. We will touch on the historical-political context of Lorca’s poetry, the Franco regime, as well as the history of the Romani people in Spain, to explore the importance of research and specificity in writing, and to better acquaint ourselves with the strongest parts of Lorca’s work and the more problematic aspects. We will also discuss the difference between exotic clichés and writing that is grounded in human experience, regardless of genre. Peter Orner Chicago born Peter Orner’s fiction and non-fiction has appeared in the New York Times, the Atlantic Monthly, Granta, The Paris Review, McSweeney’s, The Southern Review, The Forward, The San Francisco Chronicle, and Ploughshares. Stories have been anthologized in Best American Stories and twice won a Pushcart Prize. Orner was awarded a Guggenheim Fellowship (2006), as well as the two-year Lannan Foundation Literary Fellowship (2007-2008). A film version of one of Orner’s stories, “The Raft” with a screenplay by Orner and the film’s director, Rob Jones, is currently in production and stars Ed Asner. Esther Stories (Houghton Mifflin/​ Mariner, 2001) was awarded the Rome Prize from the American Academy of Arts and Letters, the Goldberg Prize for Jewish Fiction, and was a Finalist for the Pen Hemingway Award and the New York Public Library’s Young Lions Award. Esther Stories was a 2001 New York Times Notable Book. Rita Banerjee is a writer, and received her PhD in Comparative Literature from Harvard University. She holds an MFA in Poetry and her writing has been published in Poets for Living Waters, The New Renaissance, The Fiction Project, Jaggery, The Crab Creek Review, The Dudley Review, Objet d’Art, Vox Populi, Dr. Hurley’s Snake-Oil Cure, and Chrysanthemum among other journals. Her first collection of poems,Cracklers at Night, was published by Finishing Line Press in 2010 and received First Honorable Mention for Best Poetry Book at the 2011-2012 Los Angeles Book Festival. Her novella, A Night with Kali, was digitized by the Brooklyn Art-house Co-op in 2011. She is a co-director of the Cambridge Writers’ Workshop, and her writing has been recently featured on HER KIND by VIDA: Women in Literary Arts and on KBOO Radio’s APA Compass in Portland, Oregon. Diana Norma Szkoloyai is author of the poetry books Roses in the Snow and Parallel Sparrows (Finishing Line Press). Her writing and hybrid art have appeared in Lyre Lyre, Dr. Hurley’s Snake Oil Cure, The Fiction Project, Teachers as Writers, Polarity, The Boston Globe, The Dudley Review, Up the Staircase, Area Zinc Art Magazine, Belltower & the Beach, and Human Rights News. Founding Literary Arts Director of Chagall Performance Art Collaborative and co-director of the Cambridge Writer’s Workshop, she holds an Ed.M from Harvard and an M.A. in French Literature from the University of Connecticut. Jessica Reidy earned her MFA in Fiction at Florida State University and a B.A. from Hollins University. Her work is Pushcart-nominated and has appeared in Narrative Magazine as Short Story of the Week, The Los Angeles Review, Arsenic Lobster, and other journals. She’s a staff-writer and the Outreach Editor for Quail Bell Magazine, Managing Editor for VIDA: Women in the Literary Arts, Art Editor for The Southeast Review, and Visiting Professor for the Cambridge Writers’ Workshop retreats. She teaches creative writing and is a certified yoga instructor and Reiki Master. Jessica also works her Romani (Gypsy) family trades, fortune telling, energy healing, and dancing. Jessica is currently writing her first novel set in post-WWII Paris about Coco Charbonneau, the half-Romani burlesque dancer and fortune teller of Zenith Circus, who becomes a Nazi hunter. You can learn more at www.jessicareidy.com. Elissa Lewis is the Yoga & Arts Coordinator of the Cambridge Writers’ Workshop. She began her journey with yoga in 2006, when she moved to France and made the practice part of her daily routine. She saw yoga as a lifestyle, not only a class, helping her to clear her mind and have more compassion for herself and others. In 2010 she moved to New York and completed her teacher training at Laughing Lotus, a creative, soulful yoga studio that teaches the student to ‘move like yourself.’ She’s taught private and group classes in Manhattan and Brooklyn ever since. Visit her website for informative yoga sequences and information.